VERO BEACH – Two people were arrested after they allegedly fired gunshots in the woods behind the Columbia store at the Vero Beach Outlets, according to the Indian River County Sheriff’s Office. 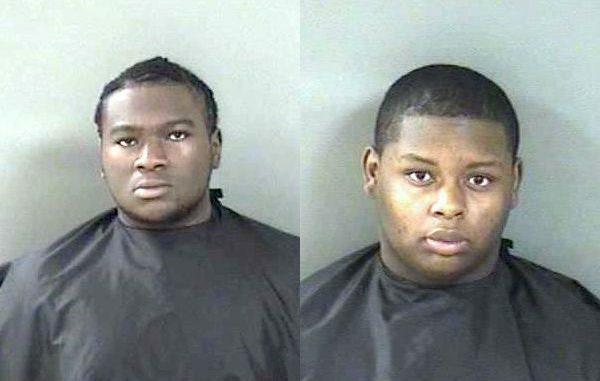 Humberto David Lee Hill, 19, and Jerome Lamar Brown, 18, were found hiding in the woods behind the Outlets in Vero Beach when deputies arrived. “I could hear footsteps as if they were running away into the woods behind the Outlets. I could also hear tree branches and bushes being moved around,” the deputy said upon arrival. The deputy stayed behind a palm tree for several minutes for cover since there were reports of shots heard directly in the area. Moments later, Hill and Brown appeared as they were walking out of the woods. There was a Mercury Grand Marquis also nearby that belonged to Brown. The deputy could see rubber latex gloves on the dashboard and the rear seat of the vehicle. A police K-9 arrived to help search for a gun in the woods, but one could not be found. However, the K-9 alerted to the presence of narcotics inside the vehicle. A small blunt containing marijuana was found. Also in the vehicle was a book bag that contained a camouflage ski mask and a pair of black gloves, along with more latex gloves. The deputy asked Hill what the two were doing in the woods behind the Columbia store at the Vero Beach Outlets. “We are out here trying to look for a place to shoot a music video later on since we can’t do it anywhere else. I’m just out here trying to get a good spot for the music video,” Hill told the deputy. When the deputy asked about the time and how dark it was outside to be looking for a place to shoot a music video, Hill advised he thought it was a good time to look around for music video sets. Brown couldn’t come up with a valid reason either for the two to be behind an Outlet store during dark. Since Hill and Brown could not dispel the deputy’s fear that they were possibly going to commit or attempt to commit a crime in Vero Beach, the two were arrested on a charge of Loitering or Prowling and transported to jail for processing.